I came across this book by happenstance. Chantal had put a hold on it at the library and I picked it up for her. I flipped through a few pages on the way home and ended up reading the whole thing over a couple of days. I knew Max Boot only through his columns at the Washington Post, which I read regularly. Lately I’ve found my favorite columnists are actually those rare conservatives and former Republicans who have become vocal critics of their former party in the wake of Trump. Folks like Boot, Jennifer Rubin, and Rick Wilson. While I disagree with them on most nuts-and-bolts policy issues, I appreciate their common stance on politics as a means of good governance, rather than a vehicle for seizing power. It’s not easy to speak up to your own team when they’ve gone stray, and I respect Boot and others like him for doing so. The Corrosion of Conservatism isn’t the sort of book I usually gravitate towards. It’s essentially a platform book, in which Boot lays out what drew him to conservatism and where he feels the movement went wrong. There’s nothing wrong with that sort of thing, but such books usually come across as fairly shallow exercises, the sort of thing people buy for the name on the cover more than the actual content. Boot’s book rises above this level, largely thanks to his experience as a writer of modern history, which he uses to provide context and depth to his arguments. 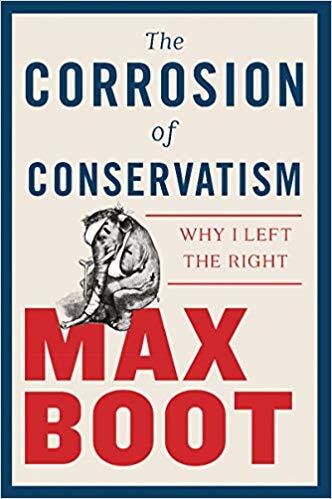 In the closing section of the book, Boot offers a mea culpa of sorts, in which he highlights the darker side of conservatism that his party affiliation had blinded him to in the past. I’m aware there are hard-liners on the left who find his past stances unforgivable, but from where I stand Boot seems to have done some real soul-searching, and willingly embraced the aspects of progressivism that partisanship alone had previously repelled, without pinballing between extremes—an act that is surprisingly common in politics. There are many stances he holds with which I still disagree, but I think he’s got integrity, and these days you can’t ask for much more than that.